In this episode we're chatting with Chris McCarter of Melbourne band IKON. 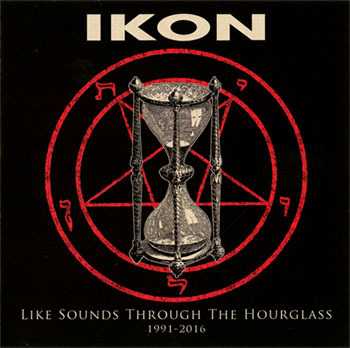 The core of the band formed in 1988 and adopted the name of IKON in 1991. They've since performed live 100+ times, toured Europe many times with slots at several highly esteemed music festivals like WGT & Mera Luna; they've made 8 albums and more than 30 singles/EPs; making them one of the most productive projects in these genres during that time. It's been long overdue to discuss things Ikon on this site. The recently released 25th anniversary compilation CD-set and upcoming live shows present the opportunity to do so! Interview by DJ Robot Citizen - Hello Chris. To start with you've recently released a new compilation titled "Like Sounds Through the Hourglass 1991-2016" ... What were your considerations in making the song selections? Chris of IKON: Hi DJ Robot, thanks for the interview. ‘Like Sounds Through the Hourglass’, is a compilation 2CD where tracks were selected by myself, that I felt best represented our progress, growth and influences over the past 25 years. I started from our original line–up in 1991 and went through all albums and singles to put together a compilation I would be happy to play without skipping in the car. Music is bigger now than ever; the majority of our new audience are downloading and finding us on facebook links and youtube [see links at the end]. Robot: And from where can people obtain the collection? Chris of IKON: People can obtain it for now from our website www.IKONdomain.com - it goes into worldwide distribution this year. Robot: Secondly, I gather that after a relatively quiet spell you're getting back in to performing live, having recently performed with Leather Strip in Melbourne. You're headlining a mid-January event in Sydney, the first gig there since 2008? How do you feel to be getting back in to the swing of things? Chris of IKON: We hadn’t played live since early 2014 due to my health problems. We had to cancel a tour of Europe that same year, because I was finding it difficult dealing with chronic nerve pain in my back. I finally had surgery late 2015 on my spine, most of 2016 was spent recovering. There were some opportunities for some gigs last year, I thought it was a good chance and time for me to get back into things. We did some writing/rehearsals in 2015 for the Dutch Christmas single Gruss Vom Krampus [youtube], but up and running again, playing these recent shows and future ones has energized the band. We are looking forward to eturning to Sydney next week, it’s been a long time. Robot: Ah how the naughty human body can have a way of getting in the way of our plans and aspirations! That must have been a tribulation; very glad you are on the mend! Soon after Sydney you are going to New Zealand, in early February? 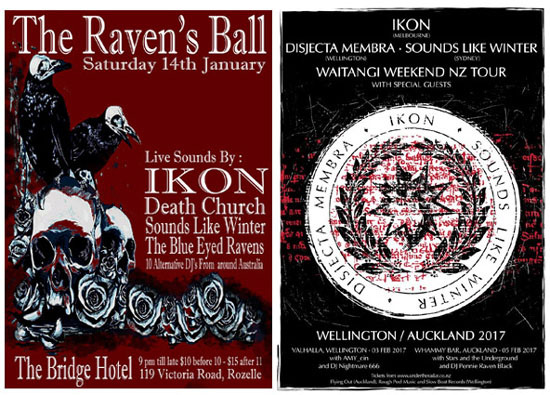 Chris of IKON: We are doing a show in Wellington and Auckland with Disjecta Membra of New Zealand and Sounds Like Winter from Sydney; who we are also playing with on the 14th in Sydney. 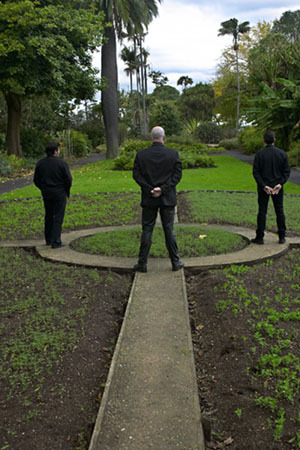 We are all connected through the darkwave music community; the NZ shows were organised by Michel Rowland from Disjecta Membra. We have played in New Zealand once, but that was actually 10 years ago. So looking forward to doing these shows. There will also be a special tour CD available featuring 3 songs from each band. We have just written and recorded 3 new ideas especially for it, the other bands are contributing either exclusive songs, remixes or versions. Looking forward to it. Robot: Are there plans for IKON to tour further during 2017? Chris of IKON: Playing these recent shows has been good, for getting us up and running, we will play a show here and there, but I think mainly concentrate on writing for a new album and looking at 2018 to return to Europe. Robot: Who is currently involved with IKON and in what regards? 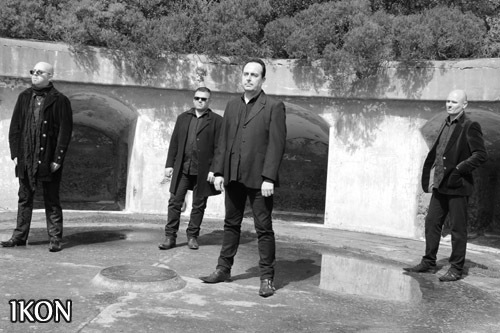 Chris of IKON: IKON is myself (lead vocals, guitars, keyboards) other founding member Dino Molinaro (bass) who formed the band together with me in 1988, Clifford Ennis (guitars, vocals) who I also worked with in Jerusalem Syndrome and David Burns (drums). Robot: Awesome, great to learn the long-term line-up is together. Now, if you had to choose 3 of your tracks that really opened doors for the band - like in reaching a wider audience, attracting promoters, enabling more live shows - what would you say those tracks are? Chris: And the third, well maybe something like ‘A Line on a Dark Day’ from 2009, something a little different for IKON very melodic, certainly our video with the most hits on youtube. Robot: On another hand, it's often the case that an artist's favourite works are one's that don't become the best known. What are 3 such tracks that are currently among your proudest creations? Robot: Are there some new recordings or re-releases of past works in the pipeline for later in 2017? Chris of IKON: We have a little ritual with rehearsals where a jam session is mandatory every night we get together. Great way to warm up and get the sound levels happening. I record that, and keep them all together. If anything stands out, I will put it aside and try and work it into a song, see what the others think. Hard to work on new material and rehearse for shows at the same time, but I think we will give both a go this year. Some members are OK with trialling new material live in it’s early stages, where not everyone feels comfortable with that. I have been re-issuing our back catalogue since 2011, as the early material was all finished and released, was easy to compile. 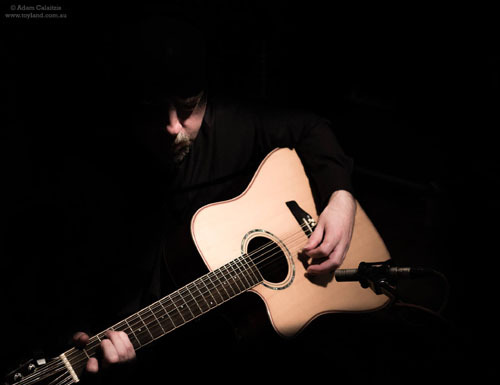 As the years went on, strangely enough, it’s become slightly more difficult with loads of unfinished/unmixed songs, live shows to put together. We will see how we go, looks like a combination of at least one re-issue and a new single will keep us very busy. Robot: Through your numerous releases you've explored many aspects of related genres - from several varieties of guitar-based gothic rock, through the electronic-based darkwave and future-pop and also acoustic-based neo-folk - what can fans anticipate in future releases? Chris of IKON: I like to incorporate my influences into the songs, right now IKON is more of a democracy than it’s ever been for a long time. 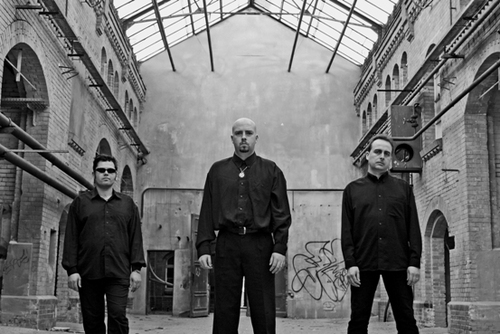 Dino tends to write more Cure influenced bass riffs, Clifford more in the goth Sisters of Mercy style, David’s drumming covers everything we need. The songs we write together as a band, sound very different to the songs I write on my own, so a combination to me is the aim. The next album will have us moving around like a time machine exploring every avenue we can. Robot: I gather that from 1989 through to now IKON has performed live around 150 times. Can you recall 3 or so events that were particularly iconic ;-) for you and what was special about them? Chris of IKON: For a band that’s been together for such a long time, we actually haven’t played a great deal of gigs actually. Being so far from our main markets of Europe and the USA, it’s difficult and costly to get there with Australian shows, we tend to go for the International support slots over the last 6 years, so we’ve hardly played at all here. Obviously, our first gig as Death In the Dark in 1989, that we organized ourselves, we booked a hall and hired the PA did all the promo, was very exciting. Our first show in Europe in 2001, although a slight blur was for us a great achievement, we never expected to play any shows outside of Melbourne, let alone in Europe. The third would be M’era Luna Festival in Hildesheim Germany in 2002, which we played outdoors and is held at an old airfield, with an audience of about 20,000 people was the most iconic one I guess after the first 2. Was also very nerve wracking. Robot: Regards video, I've read on your YT channel that your first film clip was a relatively recent one - "A Line on a Dark Day". And since then you've made several more for some earlier singles?... What took so long to make some clips - is it the costs and the time required?... I appreciate that for many musicians making video clips is perceived as an expensive and uninteresting chore... Then some find it's rather fun and opens doors... What's the experience been like for you? Has having these videos assisted the band in significant ways? Chris of IKON: Regarding ‘A Line on a Dark Day’, was actually our first “officially released” clip. We did our first clip back in 1994, for ‘Echoes of Silence’, our second single, way before Youtube days, and I thought it was lost until it was discovered in Dino’s garage in 2013. We did some clips in Germany during 2004/05 that have not been edited until recently, so there were a few done, but never finished and released. There was not much of an avenue for film clips before Youtube so we started to focus on them from 2009 onwards. A lot of live shows were filmed over the years as well, and never finished so our vaults are filled with endless projects and unfinished clips. Bit by bit, they will find their way out. The most recent one was for ‘I Never Wanted You’, a single released in 2004, video shot in Berlin that year. It was edited just late last year, I had only just obtained the footage, considering it was on the ‘Like Sounds Through the Hourglass’ compilation, now was a good time to get it completed. It’s been a fun experience for us, we did 4 for the last album for all the singles, though ‘Blood of Love’ was never finished. Videos are now such an important part of promotion with facebook sharing etc, if someone wants to look for a song, or check out a band, you go to Youtube first. So, it’s a very important part to releasing a single. Robot: When you started out did you hope or think that 25 years in to the future you'd still be making and performing your music? Chris of IKON: Not at all. I’ve been in the music industry since I was 18, that’s what I always wanted to do, but regarding IKON, we did our first single 25 years ago this year, purely as a memento to say “Look what we did back then, fun times, it’s not great but ...”. Something to show our kids was the idea I think. Our first single is nothing short of a frisbee to all of us I would imagine, bad song choices (my fault for that), badly recorded, shame really. The best thing about it, were some were pressed on white vinyl and we thought, well that’s crap we need to do something better. As for playing live, never expected anything, was never something I ever really enjoyed, only now am I actually feeling comfortable with it after all this time. Robot: Only a small percentage of musicians find themselves in a successful band/project, much less one that lasts the distance, so to speak; most fizzle out after a few years as the many hurdles, obstacles and pitfalls exact their toll. What are some of the key factors and steps along the journey that have enabled IKON to persist and keep on making music? Chris of IKON: I think you have to have a vision, great determination and will, be prepared to put in a lot of hard work, make sacrifices etc. Writing good songs, or having a good image, doesn’t mean you are going to be able to have a career in music. Of course, these things help, so many things have to come together. I love writing songs and releasing them, especially on vinyl so I was always doing it for personal reasons. Robot: Looking back over the years what are some of the major changes and challenges that you've encountered with the music industry? Chris of IKON: The biggest challenge over the years is of course the downloading and major decline in CD sales. You used to be able to rely on a certain amount of income to budget for things, recording an album, releases. On the positive side, the world is a lot smaller due to technology linking everyone together in their own homes. Music is shared and promoted for you. Robot: And how have you had to adjust? Chris of IKON: Cutting way back on recording budgets, not being able to experiment in the studio as much, or record as many songs as we used to. Need to have a clear goal well in advance and a plan of how to execute it. We built up our webstore the past few years and doing direct sales ourselves, has helped a lot for us to be able to continue along the same path. Where many other artists are going to download-only releases. Chris of IKON: We should of done it for a while back in 1995, would have benefited from it so much, but I guess we were young, I was very nervous about going and touring overseas, thought it was just too hard. I had been a couple of times on my own and just couldn’t imagine myself doing it at the time. That is one of my regrets, we just didn’t go and do it like we did a few years later. Like the first single, we thought our first tour would be our only one, as the unknown just seems too scary. Robot: I'm sure there are many who relate, share those feelings. I note that since then you've toured Europe 8 times? What about North America? Any aspirations to do so? Chris of IKON: We got into a routine of touring Europe over the years and concentrated on that market. I wish we did slot the USA in there, at some point I’m sure we will make it. Perhaps 2018 will be the year for that. We had the constant support from labels and promoters in Europe, which helped and there being plenty of festivals made it all possible.